College & Financial Empowerment | IBA Boston | Inquilinos Boricuas en Acción empowers and engages individuals and families to improve their lives through high-quality affordable housing, education, and arts programs. The Program supports low-income residents of the South End/Lower Roxbury neighborhood with employment opportunities. 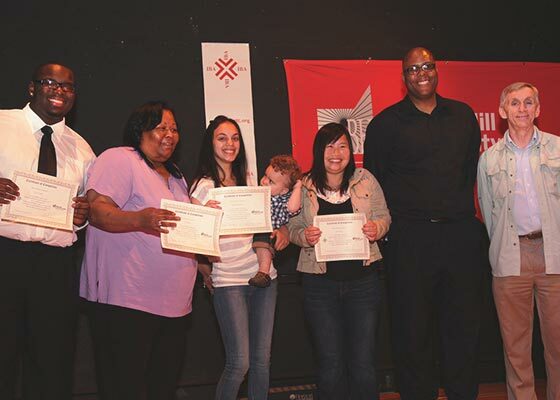 IBA’s College and Financial Empowerment Program is an innovative educational development and financial empowerment partnership with Bunker Hill Community College. Serving as a mini-satellite campus of Bunker Hill Community College, IBA offers a unique model of a college campus in the heart of an affordable housing community. The program has a strong coaching, case management component. The success Coaches guide students through the enrollment process and financial aid system; link students with tutors and learning specialists; help students create educational plans and walk them through the required courses for completion of a certificate or degree program; and connect students with employers. The program offers scholarships, childcare, books and test fees, as well as academic advising. "The program has helped me gain a sense of responsibility. Making me realize I'm responsible for the work I do and if I don't do the work, there are consequences." Complete their High School Equivalency Degree. Take adult education classes (ESL and Developmental English and Math). Enroll in College Classes on-site in Villa Victoria. Participate in job readiness and life skills trainings. For more information or questions you may contact Kay Mazara at (617) 399-1964 or kmazara@ibaboston.org. For a list of free assessment tools to help you determine the career path best suited for you, click below. Need help with money? We have the best advice here at IBA! Managing your money can be complicated, from loans, credit cards, part-time work, and bank accounts. Knowing how to handle these things can save you time and money! At IBA, we understand these things are important to keeping your family healthy. Read about how our HiSet program is helping people achieve goals they once thought were “unattainable,” click here. Follow us on Facebook and Twitter to keep updated on any upcoming events. Our Fall 2017 Session starts September 12nd. Limited space available – Register now! If you see me, back up.